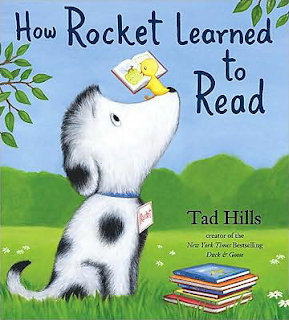 How Rocket Learned to Read is an adorable book about a dog who meets a little bird who happens to be teaching a class right in his favorite napping spot. Rocket and the bird meet up every day, and the bird teaches Rocket his letters, reads him stories, and inspires him to love learning. When winter comes, the bird flies south for the winter, leaving Rocket to practice his letters and wait for the bird to return. They develop a beautiful friendship, and Rocket finally learns to read. Take a few moments and practice your letter sounds with those magnetic letters that most of us have on the fridge. Right now, my daughter is at the beginning stages of reading and knows her letter sounds well. 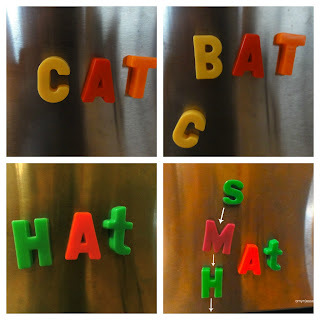 Use a simple word like "cat", and practice moving new letters in front of the "at" and ask your child to sound out the new word. Since they will be so similar to each other, it will be fun for your child to sucessfully read so many words in a row. Try the same thing with different word endings, or by moving vowels in and out of the middle of simple words. 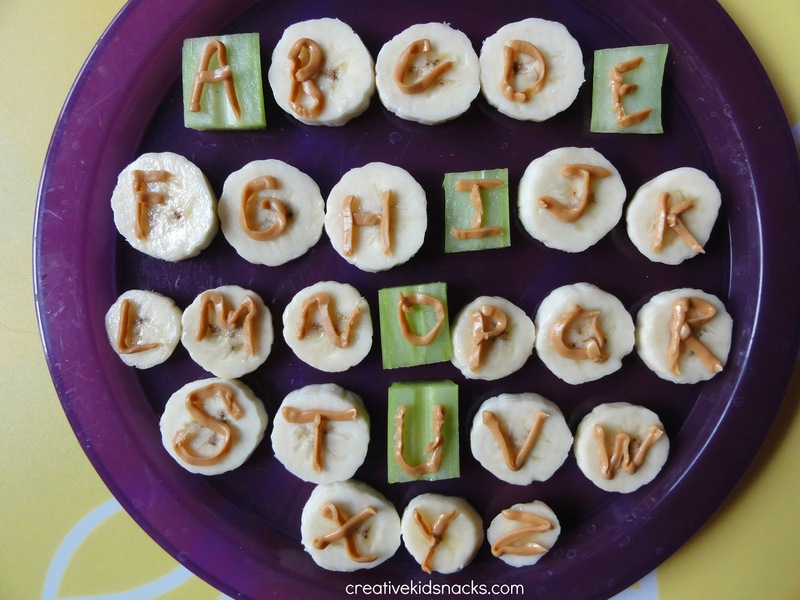 Make the alphabet for snack time! Slice a banana into 21 sections, and then find something else, like celery or perhaps apples or graham crackers, to use for your vowels. 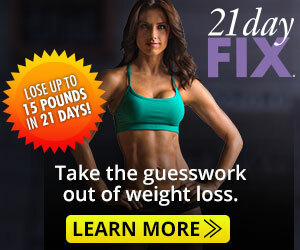 Next, find a plastic bag, snip off a tiny piece of the corner, and fill with several tablespoons of peanut butter. Before piping the letters onto each space, work the peanut butter around in the bag using your fingers until it softens a bit. It will come out much easier that way. a. Ask him to point to the first letter in his name. b. Ask her to spell her name by pointing to each letter. c. Ask him which letter makes the sound __(fill in the blank)___. 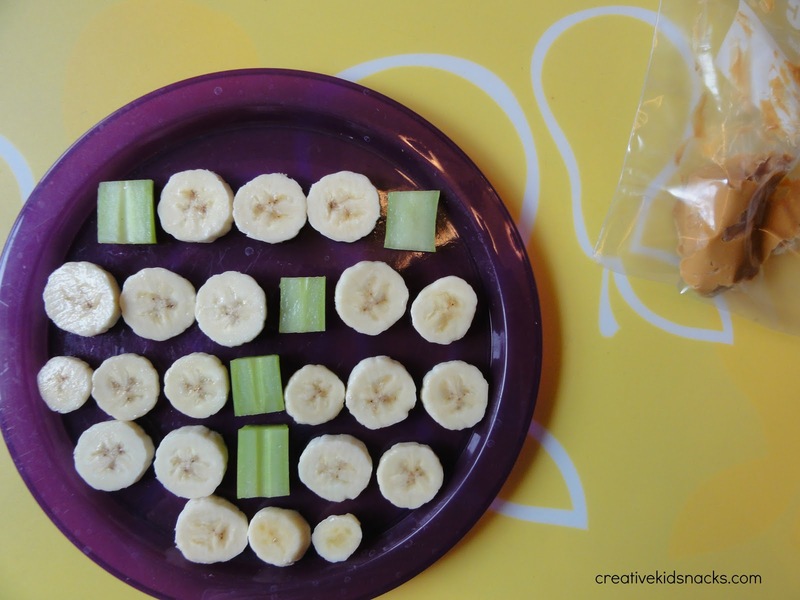 Kids will love this tasty alphabet snack!